San Pedro is blessed with an ample source of local and international volunteers. Many residents and expats who live here are active volunteers. But, fortunately many medical specialists are also happy to visit and volunteer their highly specialized skills and time. Many of them come once a year, to provide specialized services. One of the best known, and most appreciated, volunteer groups is the San Pedro Smile Center. 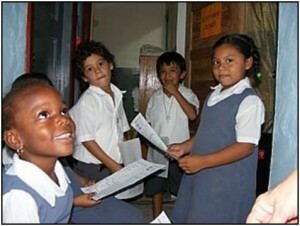 Many of our local volunteer activities are geared towards assisting the island's underprivileged children. The San Pedro Smile Clinic comes to town once a year to provide dental care for all of the island's children. This year the Holy Cross Anglican School hosted the session. The ten-member team included four dentists from the United States. I've been fortunate to meet some of the dentists when they visit, as they often come to the San Pedro Fitness Club to work out. Last year one of the dentists told me that he has returned for several years. He said that it is especially gratifying for him to see the same children return each year, with much improved hygiene practices. Medical volunteering provides these dentists with a wonderful opportunity to give to the neediest members of our community, while enjoying some downtime on our Isla Bonita.